Passover is a religious holiday for the Jewish people, but besides the spiritual part, the secular part includes lots of delicious food. Since this is the season for Easter and Passover, I will be sharing some of my recipes with all of you to try out, and would like to hear your comments. Even if you do not celebrate any of these holidays, you still can try the recipes and enjoy the food. I modified this recipe slightly, since I used fresh veggies, as I did not have the veggie crumbles, on hand. I also used spinach and carrots, instead of mushrooms. Sprinkle the remaining Parmesan Cheese over the top of the lasagna. Sprinkle the remaining Mozzarella Cheese over the top of the baked casserole, then bake for 10 more minutes. Warm up a frying pan on medium heat. Add oil, and saute the onion and garlic. Add the chopped frozen spinach, and saute until thawed. Microwave the carrots until thawed (45 seconds). Mix the Ricotta Cheese, 1/4 cup of Parmesan Cheese, 1/2 cup Mozzarella Cheese, salt and pepper, Basil and Oregano. Add egg, and mix it in. Mix the spinach with the carrots, add salt and pepper to taste. 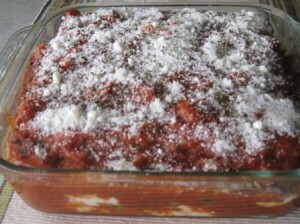 Use a square 8 x 8 glass pan, spread 1/2 cup of tomato sauce on the bottom. Wet two slices of Matzoh sheets with water, and lay over the sauce. Place 1/2 of the Ricotta Cheese mixture over the Matzoh Sheets. Spread some tomato sauce over the cheese, and top with 1/2 of the spinach/carrot mixture. Wet one more piece of Matzoh Sheet with water. Place it on top of the spinach/carrot mixture. Spread the remaining Ricotta Cheese mixture, sauce and spinach mixture. Wet two more pieces of Matzoh sheets with water. Place them both over the spinach mixture. 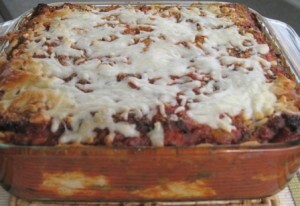 Pour Sprinkle the remaining Parmesan Cheese over the top of the lasagna. Bake lasagna on the middle rack of the oven for 40 minutes.the rest of the tomato sauce over the top and sides of the lasagna casserole. Sprinkle the remaining Mozzarella Cheese over the top, and bake for 10 more minutes, or until cheese melts,and browns slightly. If you are not planning to serve this meal the same day, do not add the Mozzarella cheese until reheating before serving. wow.. its delicious food, i will make it at home.. Thank you. You will enjoy it as well. I had some leftovers a couple days later, heated in the microwave, and it still was tasting wonderful. Also freezes well. This looks AMAZING, I had to share it with my readers! Can’t wait to get cooking!! Chag sameach! Thanks for the recipe! 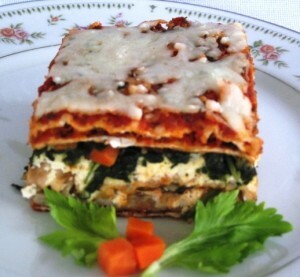 Lasagna is always a great dish for a family/holiday gathering – comfort food at its finest. My pleasure. My family and I really enjoyed this recipe. Thank you for taking the time to leave a nice comment. Thanks for posting this fantastic recipe! As a vegetarian, I’m always looking for great Passover foods. I’ve made it for our seder two years in a row and everyone loved it. This year I added mushrooms and cauliflower crumbles. I am so happy to hear that this recipe was enjoyed by everyone at your Seder dinner. Good idea about adding the mushrooms and cauliflower crumbles.